Take it from me, only bad things happen on the internet after 1 AM. 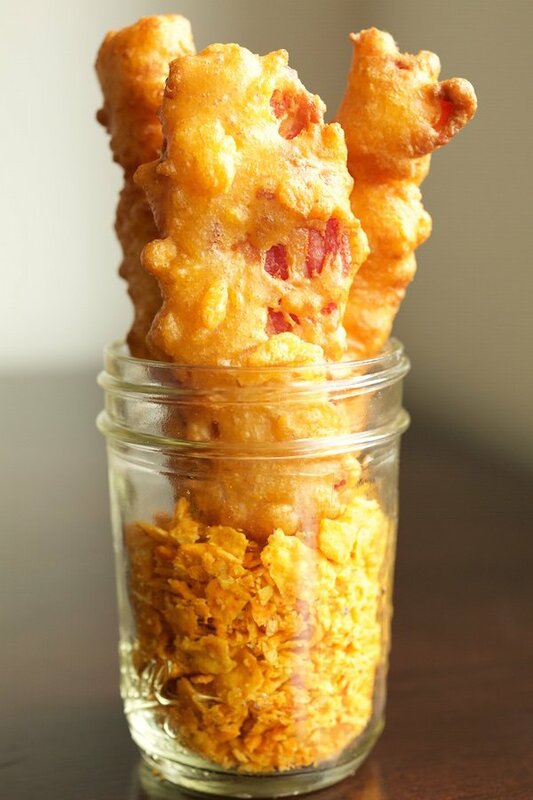 Late-night (possibly intoxicated) internet browsing is what led me to trying these Nacho Doritos Beer Battered Bacon strips. After seeing the original recipe on BaconToday.com, I could not imagine going through my life even one more day without trying it. 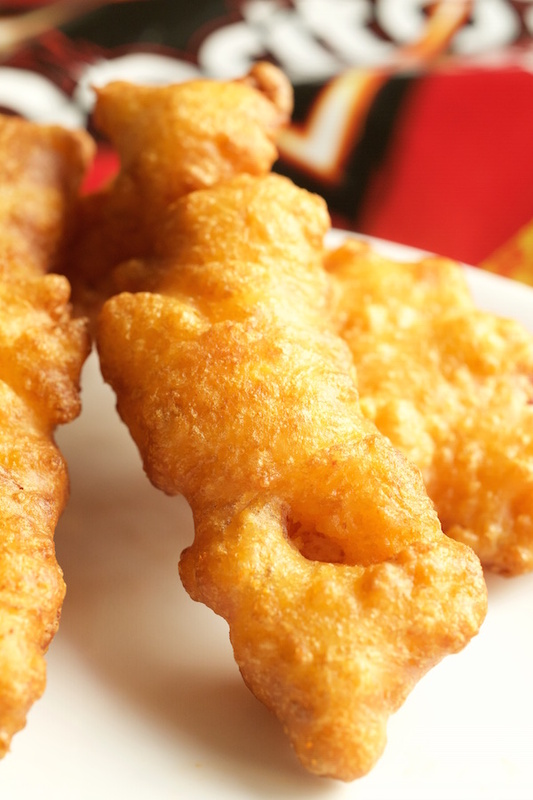 These are actually very easy to make and you can do it in a fryer or just in a pan. The trickiest part is making sure that your oil is the right temperature. If it is too hot, the outside will get crispy and burn before the inside can cook. If you don’t want to use beer, you could substitute the same amount of milk or water. I almost think milk might make it a little creamier and better. Next time I would also probably not lay the batter on so thick so that it can get crunchier and allow the taste of the bacon to come through more. Line an edged baking sheet with foil. Lay your bacon strips on the sheet, then place in the oven. Heat the over to 375 and cook for about 15 minutes. When done, transfer to paper towel-lined plate to drain excess grease. Heat 2-3 inches of oil in a deep fryer or skillet to 350 degrees. 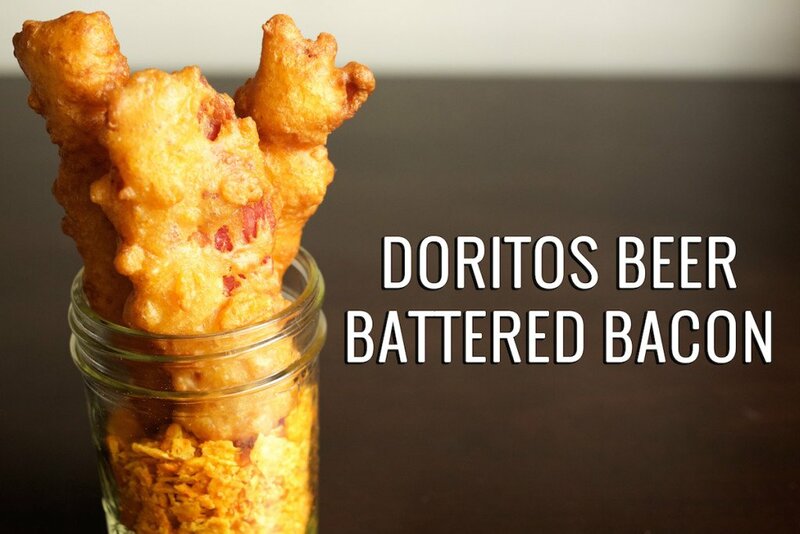 In a bowl, mix together flour, Doritos, baking powder, and salt. Mix thoroughly so that the baking powder is evenly distributed. Slowly add in 1 cup of beer. Stir until your batter is smooth. Cut the bacon strips in half, or smaller bites if you’d like, then coat each piece in the batter. Carefully drop it in the hot oil. Cook for about 2-4 minutes, turning over halfway through. Place cooked pieces onto a cooling rack or another paper towel-lined plate.